Van links naar rechts: Loe Verheijen, Hans Peeters, Paul Roefs en Marc Peerlings. 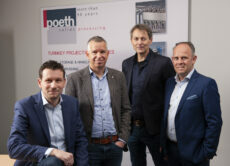 Tegelen (The Netherlands) ̶ Marc Peerlings, Loe Verheijen, Paul Roefs and Hans Peeters, the current management team of Poeth Solids Processing, have taken over all shares of Poeth BV. The official takeover was signed at the end of 2018. The current owner had been a long-distance owner of the shares since 1999. ‘Poeth’s strength lies in the fact that our development and production activities are based in-house. This guarantees our flexibility and means we can respond effectively to customer demands. As management team we’ve put a lot of thought into the takeover, and all of its members are proud that they now own the business,’ says Marc Peerlings, General Manager of Poeth. Although the team was already in charge of Poeth’s operational management, they feel they are now in an even better position to ensure the company stays on the right track. 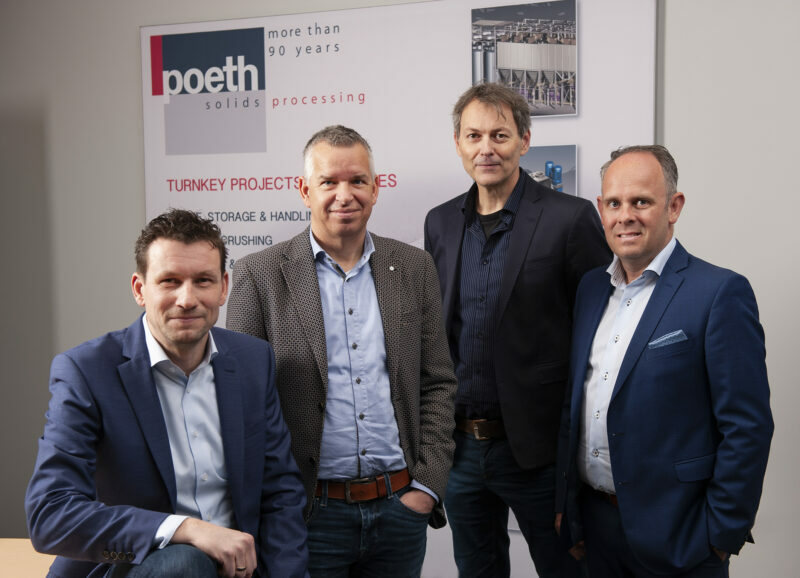 Operating both in the Netherlands and internationally, Poeth specializes in developing and constructing machines and systems for powder and bulk-processing industries. The company has 65 employees and is active in various segments, including food, feed, bulk & solids, brewing, and the chemical industry. They develop, produce, and install all their machines and carry out all their projects independently. Poeth offers a range of services, from consultancy to turnkey projects and everything in-between.